1. Celebrate Pot Luck Style! Cooking an inordinate amount of food for a large helping of guests can prove burdensome. Fatigue is not the only result from hosting a large family meal, it can take quite the toll on your wallet and your budget. Remember you will be the one is charge of cleaning, cooking and decorating and attending to your guests. Asking your loved ones and guests to chip in and bring a dish, will not only liven up people’s participation and spark all sorts of conversation, it will be energy efficient and wallet friendly too. Remember even if you have 20 people over no one person should be expected to have 20 portions of anything (apart from Turkey,) ettiquette and common sense dictates you should bring a 6-8 person serving of your dish; odds are not everyone will want to eat all components especially if it is an ethnically diverse holiday. *Tip: It’s best not to request specific specific dishes. For example, ask people to bring an appetizer, side dish, or dessert. Remember to keep track and have people RSVP with their dish so no repeats occur. 2. Make Your Thanksgiving about being Thankful for Diversity! Ethnic dishes can often be fun to whip and whimsical and can best use a great deal of seasonal ingredients (they also make a great use of leftovers.) Furthermore if you want host a vegetarian thanksgiving, it’s a great way to save because rice, beans, and vegetables are usually much cheaper than meat. And healthier too! Also be mindful of what your guests will eat, getting adventerous for a meal no one will eat is not budget friendly. A little adventure goes a long way and some exotic elements can frugally add some culinary fun to your meal. If you want to try something atraditional, why not volunteer this year for Thanksgiving? Soup kitchens and Meals On Wheels often need volunteers to help out on this important day. Not only would you skip all the buying, cooking, and cleaning, but you’d get to help others and be reminded on all the things in your life to be thankful for. Planning can save you a lot of trouble and anxiety as well can offer some economical benefits. Planning your meal helps you evaluate if you are going overboard and if your budget can indeed handle what you have in mind for this meal. Also getting a head start on shopping can offer you significant savings as coupons and circular post savings keep an eye out for things that fit your meal plan. Remember you don’t need to be Martha Stewart to have a well executed plan, keep it simple and fun, you want to enjoy your company and the holiday not be a slave to it. Skip the expensive pre-made decorations. Try something natural! Get inspired by nature, perhaps flowers from your garden or branches that look particularly rustic and pretty (there are a number of trees with interesting textures and colors, for example white birch. Let food be your guiding star, i.e. beautiful dark green acorn squash, and other fall fruits and veggies that can be eaten later. 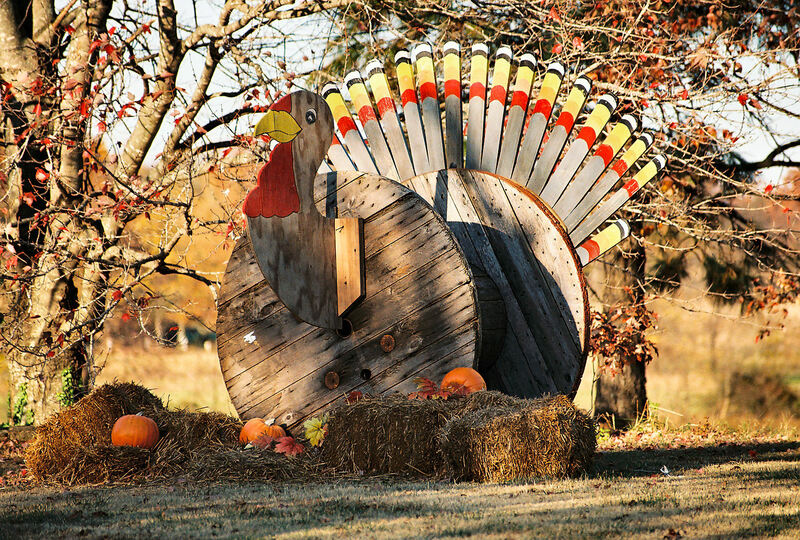 You can also think outside the box, Thanskgiving doesn’t need to be fall colors and turkey, maybe do something kooky and fun, lets the sale bins be your inspiration and have fun. Try to plan it so that all of your pies and baked goods go into the oven at the same time. This will save on energy costs, just make sure they all need the same temperature, undercooked food is not fun for the holidays. Sometimes making more can be a blessing in disguise. You can freeze uneaten portions and have plenty for leftovers in the months to come. That’s having your cake and eating it too. Making your own pie crust is much cheaper than buying it frozen or prepared. Check out Make the Bread, Buy the Butter: What You Should and Shouldn’t Cook from Scratch — Over 120 Recipes for the Best Homemade Foods it’s a great book filled with recipes and money saving tips for the kitchen. This entry was posted in Education & Finance, Holiday Fun on a Budget and tagged Ahorro, All, Budgeting, Budgeting a Thansgiving Good time, Community, Cost Cutting, Culture, Current Events, Decor on a Budget for Thanksgiving, Design, Education, Ethnic Holidays, Ethnic thanksgiving, events, Familia, Family, Financial Education, Financial Independence, Food, Free Stuff, Friends, Fun, Holiday decorating tips, Holiday Fun on a Budget, Holidays, Home, Hosting Thanksgiving, Independencia Financiera, Life, Lifestyle, Money Saving, Money Saving for the Holidays, Money Saving Tips for Thanksgiving, News, Opinion, People, personal, Planning Thanksgiving, Pot Luck Thansgiving, Recipes, Thanksgiving, Thanksgiving Tips, Thansgiving Tips, Turkey Day, Turkey Day Tips. Bookmark the permalink.